Sujari Britt appeared on Show 237, recorded in June 2011, at the age of 10. 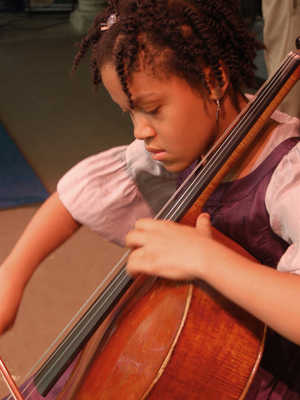 Sujari Britt (cello), age 10, is from New York City and is home schooled. She is a recipient of From the Top’s Jack Kent Cooke Young Artist Award. Sujari studies the cello with Marion Feldman at the Manhattan School of Music, and also plays the piano and violin. She is a member of JoSunJari, a string trio with her siblings Sunnaj (age 12, violin) and Joelk (age 18, violin). Sujari has performed at the White House with cello virtuoso Alisa Weilerstein and met Yo-Yo Ma, who played her cello. In her free time she enjoys drawing, painting, reading, and writing. Sujari is a Jack Kent Cooke Young Artist.